Alex and I would like to take a moment to appreciate and acknowledge Gena Schirer. Gena joined us last May and has been coming in consistently ever since. She has been so positive, humble and fun to have in our class. Gena always comes in smiling, happy and eager to learn! We love your upbeat energy Gena and are stoked to see you progress every week! I have always worked out but in a much different format than CrossFit. I was a fairly religious member of Baseline and Orange Theory and did enjoy them at the time. I had two babies while doing those workouts up until the night before I gave birth both times. Although they were fine, I never really saw a change in my body and never felt like I was apart of a community like I do now. I would do my workout and go home, rarely getting to know anyone and it was not a lot of heavy lifting, mostly a lot of cardio. Even though I was thin, I really was not very strong. Since doing CrossFit 10 months ago, I have noticed huge changes in my strength and muscle tone! opposite has been true. I have seen amazing growth in less than a year at CrossFit Chateau. I still have a long way to go but there are so many moves I can do now that I never thought would be possible and I’m not bulky at all, but I do have some muscles! There are two aspects that are the most amazing to me, though, outside of changes in my strength. First, what I notice most, is that I have more energy and strength when I play with my kids. Lifting them and throwing them and keeping up with them is much easier now. This has changed how our family behaves because I can engage with them in ways I couldn’t before. Second, is the friends I have made. CrossFit isn’t a cult, it’s a group of really welcoming people who encourage you to grow. I have met so many great people and that makes working out fun, not a chore. As I write this from vacation, I actually miss the gym, the coaches and my friends there. We want to take a moment to appreciate and acknowledge Lawrence Ebel. He is someone that is very sweet, genuine, fun and inspiring to many of you and especially to us. Before starting with Crossfit Chateau, Lawrence had done Crossfit for about a year in 2012 while he was in dental school. After school life got busy for Lawrence and he stopped working out. In doing so, Lawrence gained a lot of weight and just felt unhealthy. In January 2017 he started the Keto diet and working out again at a big globo gym. Soon realizing that he truly missed the intense workouts that Crossfit gave him. Right before moving to the Seattle area, one of Lawrence’s friends invited him to do a WOD and he got hooked on Crossfit again. Lawrence joined Crossfit Chateau back in July 2018 when he moved to our area. His plan was to check out a few local gyms and make a decision, but after one class at Chateau he knew it was the right gym for him. 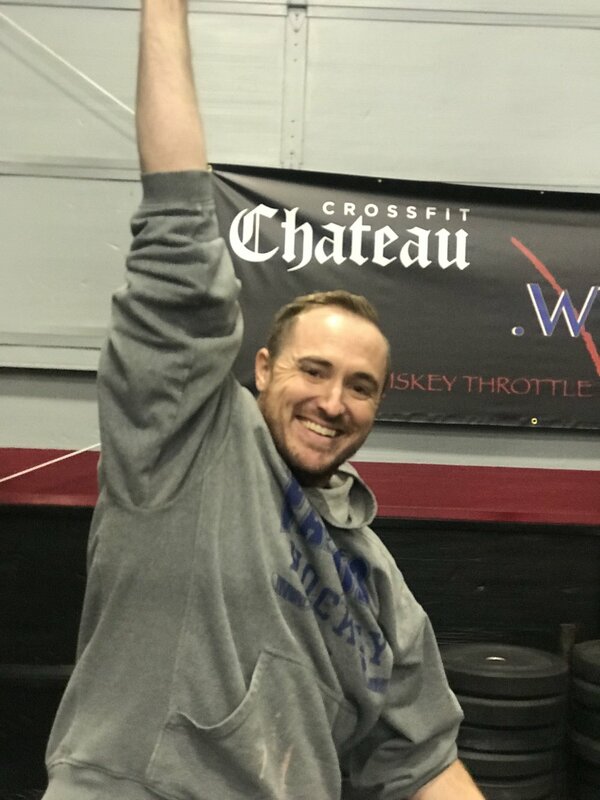 Lawrence says, “The coaches are awesome and the community that we have is unbeatable!” Since joining CF Chateau Lawrence has achieved his first bar muscle up, his first ring muscle up and has made a lot of great friends. He has also lost almost 20 lbs, thanks to Crossfit and the keto diet! With all that said, Lawrence, we couldn’t be more proud to have you as a part of our CrossFit Family! You seriously have such a magnetic personality and we love seeing you every week. It is always so nice to see you walk in and walk out with a big smile on your face. You’ve really helped keep the camaraderie strong here and it has been truly rewarding seeing you PR and reach so many goals with us! We want to take a moment to appreciate and acknowledge Daniel Schaffer. Daniel joined us last Sept and has been coming in consistently ever since. When Daniel first started with us he had a Powerlifting background, but quit training in 2016 when he moved to Seattle from Charlotte. Like most of us, he let the stress of his new job and cross-country pretty much kill his daily gym routine. Over 2016 and 2017 Dan gained 50 lbs while adopting a largely sedentary lifestyle. Luckily he started training back up again mid-2018, and joined Chateau in Sept. So far, he is down 15 lbs and has increasingly gained upper body strength! Dan claims to still hates burpees like the rest of us, but says they're getting there! With his persistence and dedication, Dan can now do 5 strict pull-ups, up from 1. A few other goals he has reached is getting his first Pistol and Rope Climb in Dec. His endurance is improving and strength is coming back in some of his major lifts, despite a current setback w/ a back surgery. CF has given him structure back to his weeks. It's also helped him gradually dial nutrition back in, as the transition into his 30’s was less than graceful, per Dan:) Dan enjoys suffering together, and is stoked that CrossFit has helped him find that extra gear again that had been missing for awhile. Reaching new goals and pushing himself has not only made him feel better as a person it has also spilled over into his work life giving him more energy and allowing him to be more productive there as well. More than anything, Chateau has provided him a community for accountability and motivation. There's a lot of humble monsters at CrossFit Chateau and he aspires to be one of those again! Dan you have not only reached some awesome goals in the 7 months you have been with us but you have been so eager to learn correct form and improve your athleticism. We love how coachable you are and not only receptive to our feedback but very grateful. There is nothing more rewarding than having a member who loves feedback, makes the changes and continues to learn and improve all the while being humble and grateful. Dan we are stoked you have joined our community and we can’t wait to see you take CrossFit and Oly to the next level! We want to take a moment to appreciate and acknowledge Toinette Watson. She is someone that is very special and inspiring to many of you and especially to us. Sept/Oct 2018 Tonee found out that she was struggling with really bad tendonitis in both forearms as well as ongoing pain from arthritis in both thumbs and wrists. Her left shoulder which had been giving her issues, could have been a contributing factor to the tendinitis in her elbows due to overcompensating. For a good 3+ months Tonee had to modify every single workout. But she still showed up even if it meant squatting yet another day! Between Physical Therapy and help from Sport and Spine, she is now seeing some progression and able to incorporate using her arms more. If you know Tonee, you know her passion for competing and pushing herself further than most of us ever dream of. Being a competitor I can only imagine how not only humbling but very difficult it would be to have to take ten steps back and essentially although temporary, loose many gains and goals you’ve worked so hard to accomplish. Here are some of Tonee’s recent accomplishments over the last few years. During the CrossFit Open in her division worldwide she placed around 150th in 2016, 562nd in 2017 and place 124th this year after the online qualifiers. Rockstar! With that said Tonee, we have watched you come in here without skipping a beat for the last 3+ months smiling, laughing, cheering on everyone all the while you are feeling defeated and broken. You are such a strong and caring friend who has portrayed to us all what true strength looks like. We love you hun and are so blessed to have you amongst us here at CrossFit Chateau. Kelcy Ware is an amazing athlete. She has been a part of our community for the past 3 years and she is on a mission! This is her 4th Regionals as an Individual Athlete and she is not stopping there. Every year gets harder and she continues to get stronger and better amongst the field of other women. This year, our Northwest Region was combined with California and West Canada, making the West Coast Region. California is saturated with awesome athletes, so it could be intimidating to most, but not Kelcy. With what we thought to be a more competitive, denser and intense region, Kelcy showed her strength, poise and drive by placing 10th! Top 5 get a ticket to the CrossFit Games, so this means she is getting so close! Day 2 of Regionals, Kelcy placed completely last in the first of two workouts. She came out on fire, dropping the jaws of all watching, proving her competitiveness placing FIRST on the second workout 2 hours later! We are so proud of you Kelcy and we are excited to train with you throughout this next year! Keri Wille (Co-Owner) started CrossFit in 2011. Back when Regionals was a little more attainable, this mom of 2 qualified for regionals individually 2013 and 2014. Keri self taught herself the gymnastic aspects of CrossFit and by pushing herself during the daily WODs she was able to climb that ladder making it to Regionals. In 2014 Keri qualified again for Regionals as an individual, however she wanted more than anything to take her training partners as a “team” and forfeited going individually to make that happen. Both were amazing experiences that she wouldn’t trade for the world. Making it to Regionals was an empowering and humbling experience!